Aus unserem Archiv: Im Jahr 2013 stellte Bruce Lindsay aus Australien lancianews eine Reihe von Artikeln zur Verfügung, in welchen er korrespondierend zu seinem Buch „70 Years of Trailblazing“ aus dem Jahr 2009 herausragende Modelle der Marke Lancia von den 1930er bis in die 1970er-Jahre umfassend beschreibt und bewertet. Mit diesem letzten – vielleicht nicht ganz unpassenden – Bericht haben wir alle Artikel Bruce Lindsays aus unserem Archiv geholt. Der Nachsatz ist allerdings nicht mehr passend, passte 2013 allerdings in die Stimmung der Lancia-community. Worüber könnte man heute „scherzen“? 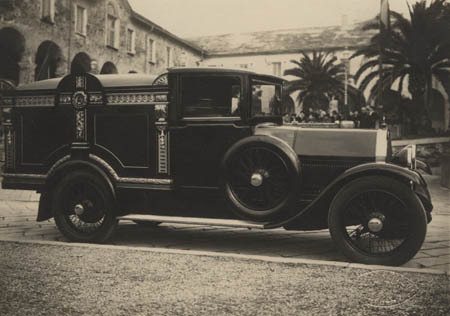 ‘Professional vehicles’ are those associated with the funerary industry – hearses, mourning coaches, flower tenders – and ambulances. The Professional Vehicles Association caters for enthusiasts of such vehicles, its rather droll newsletter titled „The Mourning News“. While the name Lancia usually conjures up images of finely made sporting and passenger cars, Italian enthusiast Marco Sambataro has kindly sent to me photographs of his restored Lancia Appia Jolly hearse. Aside from the inappropriateness of the model name to this particular application, recall that the Jolly used the standard Appia V4 1089cc engine, detuned to produce 36.5bhp. Clients’ last ride would have been suitably processional. On the standard wheelbase, it would have accommodated only very short coffins, or perhaps they were carried on the roof? 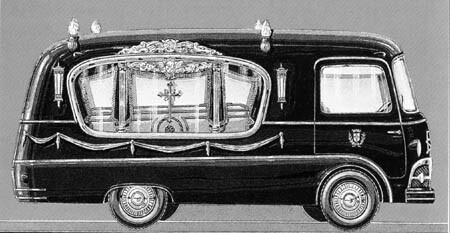 Lancias as funeral coaches included an elaborately decorated Theta, rebodied in the 1920s in Italy, and Milanese coachbuilder Garavini offered a ‘first class hearse’ on a Beta Z51 chassis in 1951 for the local municipality, the rear section of which resembled a television set through which the mourners could view the deceased’s last transport of delight. Since Marco lives in Milan it is possible that his unjolly Jolly was also bodied by Garavini. 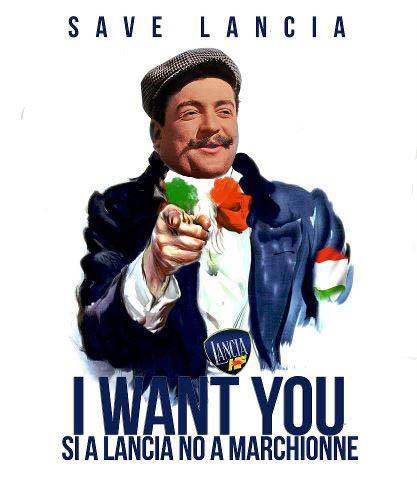 Eine ein/zweideutige Assoziation zum Thema “Lancias to die for“ kam uns, als uns ein wohlmeinender Freund untenstehende Karikatur schickte. Allerdings gibt es derzeit bei Lancia kein Fahrzeug im Erzeugungsprogramm, das für diese Aufgabe modifiziert werden könnte.